Submit a story idea to editorKen Swarner. The Ranger, Airlifter and NW Veteran are committed to providing South Sound military personnel, families and retirees insight into the community as a whole. Blog-Ah! 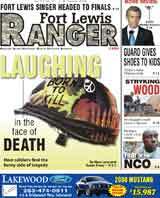 looks to keep readers up to date on events, news and personalities taking place in and around Fort Lewis and McChord Air Force Base. Equally, we remain steadfast in helping inform and educate those troops and families moving to the South Sound – from the housing market and schools to entertainment and recreation – we are your one source. Our papers are easy to find both on and off the installations. In addition, we publish the South Sound's favorite weekly entertainment newspaper, the Weekly Volcano.